The new digester magmeter enabled accurate and stable flow measurement of the black liquor extraction line. The flow rate of the extraction line is the most important factor currently available to control the liquor balance in the pulp washing process. The new ceramic magmeter enabled accurate and stable flow measurement of the pulp blow line, helping the user to better monitor and control the amount of pulp being produced. The new magmeters were designed to withstand the very severe digester conditions without frequent maintenance. Field test results over a five-year period proved their effectiveness in reducing dangerous maintenance work around this extremely high temperature / high pressure process. The continuous digester is the heart of many pulp mills, and it has been an ongoing challenge for the pulp & paper industry to obtain the best possible performance from this technology. Improved digester performance translates to higher quality improvement and lower costs, and simultaneously contributes to the industry-wide causes of protecting the environment and conserving natural resources. The combination of extreme high temperature, high pressure, and corrosive alkaline fluids with high slurry content within a continuous digester poses a serious challenge to those who are working to raise the performance of this core pulp production facility. For many years, Yokogawa has been working with the pulp & paper industry to help it achieve its dual aims of quality production and environmental protection through innovative sensing and control technologies. One of Yokogawa's recent collaborations with the pulp & paper industry is a joint effort over the past decade to develop new flow measurement solutions for continuous digesters. Stable and accurate flow measurement is key to improving the performance of a continuous digester. There are three areas where traditional measurement methods have not been entirely satisfactory: the black liquor circulation line, the black liquor extraction line, and the pulp blow line. Better measurement would allow users to minimize cooking temperature fluctuation in the circulation line, know the exact liquor balance in the extraction line, and control the amount of pulp produced in the blow line. Flow in the black liquor circulation line and the extraction line has traditionally been measured by the combination of an orifice and a differential pressure transmitter. Due to the high temperature / high pressure / corrosive nature of the fluid, there has been until now no viable alternative. The orifice plus DP solution has limitations, namely the inevitable accumulation of sludge on the orifice plate and the clogging of the impulse line that leads to deteriorating measurement. In some cases, the remote diaphragm seals also fail due to corrosion or hydrogen permeation. As a result, most orifice / DP applications in these lines stop working within two years of installation, forcing users to make do with educated guesswork. The pulp blow line poses its own challenges. The conventional measurement method has been to use a PFA-lined electro-magnetic flowmeter, but the high temperature of the slurry causes abrasion of the magmeter lining and fluctuation in the output signals. Maintenance work is frequent and costly, making accurate and continuous measurement difficult to perform. Working closely and doggedly with users who share our passion for taking on seemingly impossible challenges, Yokogawa engineers have crafted innovative sensing solutions that enable stable and accurate measurement in these applications, something the users themselves had almost given up on achieving. Expanded temperature / pressure range of the PFA-lined "digester magmeter"
For the extreme conditions of the circulation and the extraction lines, where the traditional orifice / DP solution is not really up to the task, Yokogawa engineers first investigated the possibility of applying a ceramic-lined magmeter. After a joint investigation and trial with the users, it was decided to look at an alternative solution as the ceramic detector had not yet proven 100% reliable under the extreme high-pressure / high temperature / high alkaline conditions of these particular applications. A PFA-lined detector was their best shot, but existing PFA magmeters were known to develop lining creeping at extremely high temperatures, posing the risk of a sealing integrity failure following extended use. Yokogawa engineers responded to this challenge by creating a PFA-lined magmeter that could withstand digester conditions. A new, internally inserted electrode was developed to prevent lining creeping. Also added was a set of unique grounding rings that prevents inlet inner diameter deformation under extreme conditions. In so doing, a new "digester magmeter" was designed that was capable of providing stable and accurate flow measurement under the extreme high temperature / high pressure conditions (170 degrees centigrade and 1.3 MPa) that were traditionally outside the range of PFA magmeter technology. Half impressed, half appalled by the sheer tenacity of the Yokogawa engineers, the users allowed Yokogawa to install the new magmeters next to the existing sensors. The customer engineers played a major part in the extensive field testing that followed, joining forces with the Yokogawa team to overcome various challenges that surfaced during the actual application of the new technologies. The field tests continued for more than five years, and both the ceramic magmeters in the blow line and the digester magmeters in the circulation and extraction lines proved themselves in the field. They continued to provide vastly improved flow measurement outputs without a hitch. Even though the blow line's ceramic magmeters had performed flawlessly and had withstood pressure testing up to 6.0 MPa, the users opted to test the devices to determine how much corrosion had occurred after five years of steady use in the field. Although this required the removal and cutting apart of the magmeters, the users insisted on doing these tests at their own expense in the belief that the knowledge gained could benefit the entire industry. 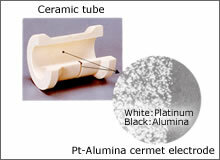 The testing results confirmed that the corrosion depth of the ceramic lining was no more than 0.1 mm per year. This field data clearly proved the applicability of the ceramic magmeter technology to the blow line application, significantly reducing the maintenance work and improving the accuracy of measurement and hence the efficiency of production. compared to the PFA magmeter. The new digester magmeters also proved to be a big step forward in stable and accurate flow measurement, leading to improved digester performance. One very clear proof of its superiority came from its test results in the black liquor extraction line. Since the extraction line stays pressurized, traditional orifice flow meter never reported zero flow even when there was actually no flow. In contrast, the new digester magmeters can accurately measure low flow, reporting zero when there is no flow. This accuracy was an added bonus to the stability and reliability of the new magmeters. 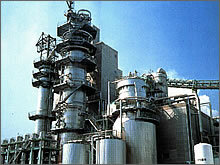 Since this initial success, more than a dozen continuous digesters in Japan have adopted Yokogawa's digester ADMAG flowmeters, successfully improving the productivity of the pulp mills.The pulp and paper industry continues to introduce innovative digester technologies that increase productivity while protecting the environment. The Yokogawa engineers involved in this project continue to collaborate with users in search of yet more innovative solutions that will help the industry achieve its dual goals of business success and social responsibility. Yokogawa ADMAG series electro-magnetic flowmeters are the most accurate and stable magmeters available in today's market. The unique dual-frequency excitation technology makes ADMAG applicable to both low conductivity fluids and high degree slurries. Yokogawa has recently introduced the new ADMAG AXF series magmeters, which inherited and further improved the accuracy and stability of the ADMAG series. Developing such innovative new sensors is of course the dream of the Yokogawa engineers, but the true satisfaction of our vigilant field instruments specialists comes from the innovative new applications they continuously develop with the user. Especially gratifying are those cases where the new solutions give users the insight and capabilities that help them mange potentially dangerous processes with improve safety and reliability. The test results of the new digester magmeter in the extraction line. Damping 3 sec. When flow rate dropped down to zero, the new PFA magmeter faithfully reported zero flow, which was a clear improvement over the traditional orifice flow meter. For more information about Yokogawa magnetic flowmeters, please visit our Field Instruments (ADMAG) Site. ADMAG SE is the Safe and Easy magnetic flow meter which makes your job simple and effective. You will increase the productivity and profitability. The installation, operation, and maintenance are all safe and easy. ADMAG SE is equipped with a dual compartment housing providing ease of wiring while isolating the electronics from the environment. It is also prepared with HART or BRAIN communication as standard and its light weight makes installation easy.